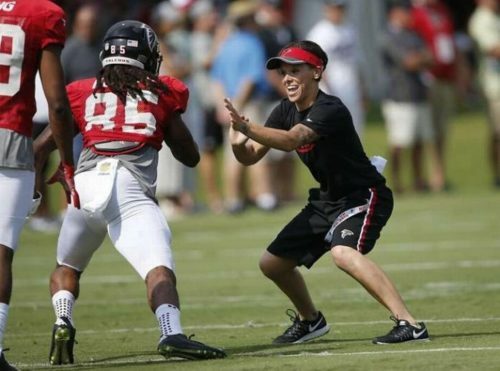 Katie Sowers is only the second full-time assistant coach in the NFL, following Kathryn Smith, and with an interview published today by OutSports, she has also become the first openly LGBT coach in the league’s history. Sowers spent 2016 with the Atlanta Falcons and is now with the San Francisco 49ers. She played pro football in the Women’s Football Alliance, along as did her twin sister, Liz. She was integral in helping the U.S. win the women’s world title and gold medal in 2013. “The more we can create an environment that welcomes all types of people, no matter their race, gender, sexual orientation, religion, the more we can help ease the pain and burden that many carry every day,” she added. Sowers counts Falcons assistant general manager Scott Pioli a friend and mentor. Pioli was also instrumental in former Kansas City Chiefs and New England Patriots lineman Ryan O’Callaghan come to accept his own sexual orientation. Sowers has a girlfriend, Sheila, who she met and befriended at a football event. The entire OutSports interview is well worth the read, as she is truly inspirational.